The two winners of the regional selection for the best frangipane and brioche. In Deux-Sèvres, 17 bakers and confectioners have participated to the best puff pastry king cakes competition in Niort. This contest was held at the Deux-Sèvres bakery federation. Christmas holidays were not over yet and bakers were already refining their recipe for the epiphany cake of 2018. Upstream, the regional contest of the best frangipane epiphany cake made with Charentes-Poitou PDO butter starts with regional selections. 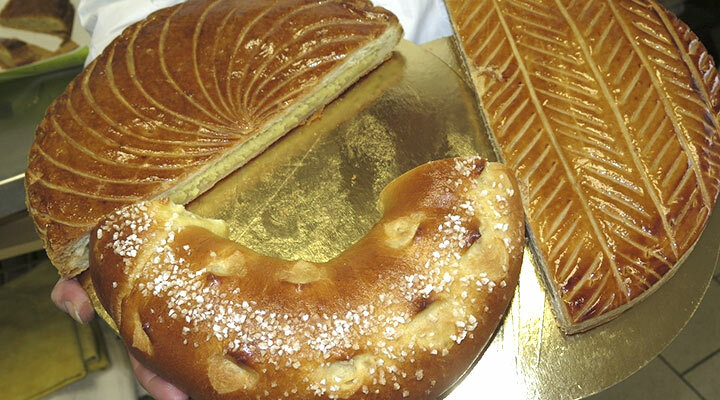 In Deux-Sèvres, the two best frangipane epiphany caked have been selected on Tuesday, December 5. Beautiful brown frangipane cakes, with delicate aroma, were displayed in front of a jury, half composed of professionals. Appearance, taste, cooking, decor, consistency… The jury had the delightful task of evaluating each of the delicacies. Two epiphany cakes distinguished themselves. They were selected for the regional final in January 11 in Bordeaux. They were made by d’Eric Chevallereau, a baker-confectioner at “Confidence gourmande” in Echiré (also Meilleur Ouvrier de France) and by Didier Grenier, from La Mie Niortaise in Niort. Article Suivant : Echiré butter on Japanese television!